Both Cyberpunk and Steampunk are captivating sub-genres within the world of science fiction and are related to technology and advances in technology, they’re actually worlds apart. While both are popular alternative styles with similar futuristic elements rooted in the world of fiction, the difference lies in the discipline and where they take their inspiration from. Cyberpunk is a style set much further into the future, something that spring from the modern age of the Internet, whereas Steampunk is way more aesthetically pleasing but with a historical setting and mainly focuses on a Victorian inspired look. 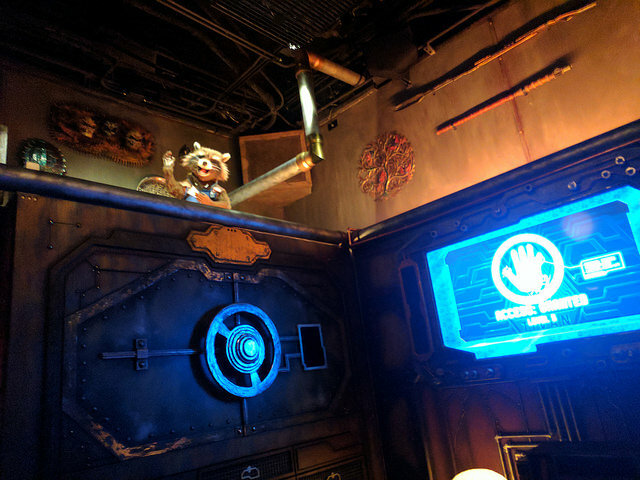 Steampunk combines historical elements with old-school technological features inspired by science fiction, whereas Cyberpunk is a futuristic world dominated by computer technology. We look at the differences between the two. Cyberpunk is a sub-genre of science fiction based upon technological innovations which is set much further into the future and that spring from the modern age of the Internet. In cyberpunk, the present, the past and the future are inextricably intertwined in a lawless oppressive society largely controlled by computer technology. It focuses on all-things high-tech such as cybernetics and artificial intelligence. Cyberpunks are not exactly technology proficient, but are intrinsically adept at it. It often highlights computers and robots, and often showcases a dystopian society dominated by technology. Steampunk is a sub-genre based upon technological innovations from an alternative world inspired by Victorian-era technology. It is inspired from the 19th-century romances of H.G. Wells, Jules Verne, and Mary Shelley and relates to the romantic look at the advances in technology in the Victorian era. The Steampunk fashion is based on a Victorian inspired look, with clothing from the Victorian era such as hats, purses, corsets, waistcoats, parasols, etc. It often highlights steam-powered machinery rather than advanced technology. Both are sub-genres of science fiction that often take place in alternative world powered by technology with similar futuristic elements, they are worlds apart. Cyberpunk refers to both a culture and a science fiction genre that features technology and science in an urban, dystopian future. It’s a futuristic world portrayed as the one in which the society is largely controlled by computer technology. Steampunk, on the other hand, combines Victorian era aesthetics with the science fiction imagination. It is a sub-genre based upon technological innovations from an alternative world inspired by Victorian-era technology. Cyberpunk is a sub-genre of science fiction mainly set in a lawless subculture of a society largely dominated by the Internet and science. It is a style set much further into the future with strong emphasis on advanced technology such as robots, computer games, World Wide Web, Artificial Intelligence, and more. 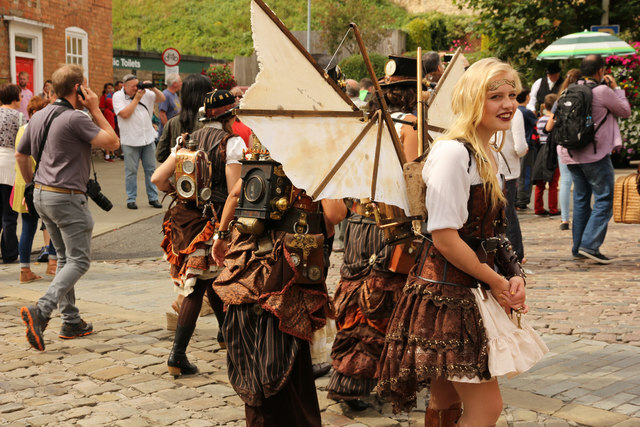 Steampunk focuses on anachronistic technology but with a technological twist. It mainly uses technology and aesthetic designs inspired by the 19th century industrial era. It refers to an alternative world largely dominated by steam-powered machinery rather than advanced and modern technology. Technology is an integral part of Cyberpunk which separates the sub-genre from conventional science fiction. It is a style that focuses heavily on high-tech features, advanced technology and scientific achievements. It deals with technology that doesn’t even exist yet such as cybernetics and Artificial Intelligence. Steampunk is a fusion of technology and aesthetics inspired by 19th-century steam-powered machinery. The technologies often on display are airships, steam-powered cars, analog computers, etc. It is based on a notion that era of steam-powered technology continues. Steampunk deals with technology that is outdated. The Cyberpunk is highly influenced by the New Wave Science Fiction Movement of the 1960s and 1970s, which, according to Michael Moorcock, is an era which rediscovered its visionary roots to create more literary and experimental forms of fantasy and science fiction while rejecting American pulp traditions. As a result, it leads to the emergence of Cyberpunk in the 1980s. Steampunk draws its inspiration from 19th-century romances of H.G. Wells, Jules Verne, and Mary Shelley. It relates to a more romantic look at the technological advances in the Victorian era. The term Steampunk was first coined by the Morlock Night’s author K.W. Jeter in 1987. Steampunk fashion is sub-genre of the Steampunk movement in science fiction and is purely based on the Victorian style aesthetic with clothing from the era, such as corsets, purses, hats, parasols, bustle skirts, waistcoats, tail coats, bonnets, and Victorian hats trimmed with flowers, feathers, and ribbons. Cyberpunks depict a decaying dystopian world with a touch of modernism. The cyberpunk fashion is all about urban street fashion with a gritty look and futuristic makeover. It often features a dark base of colors with accompanying items such as trench coats, jeans, and accessories such as goggles at times. In a nutshell, Cyberpunk focuses on the near future with technology that doesn’t even exist yet, whereas Steampunk is inspired by Victorian-era technology. Cyberpunk is a fictional world set in a lawless subculture of a society largely controlled by computer technology, whereas Steampunk is a sub-genre of science fiction that incorporates outdated technology and aesthetics inspired by the 19th-century steam-powered machinery. The major theme of Cyberpunk and Steampunk movies is technology and its impact on human nature, except Steampunk is set in 19th-century industrial era with steam powered machines and Cyberpunk is the near future. Sagar Khillar is a prolific content/article/blog writer working as a Senior Content Developer/Writer in a reputed client services firm based in India. He has that urge to research on versatile topics and develop high-quality content to make it the best read. Thanks to his passion for writing, he has over 7 years of professional experience in writing and editing services across a wide variety of print and electronic platforms. Outside his professional life, Sagar loves to connect with people from different cultures and origin. You can say he is curious by nature. He believes everyone is a learning experience and it brings a certain excitement, kind of a curiosity to keep going. It may feel silly at first, but it loosens you up after a while and makes it easier for you to start conversations with total strangers – that’s what he said." Sagar Khillar. 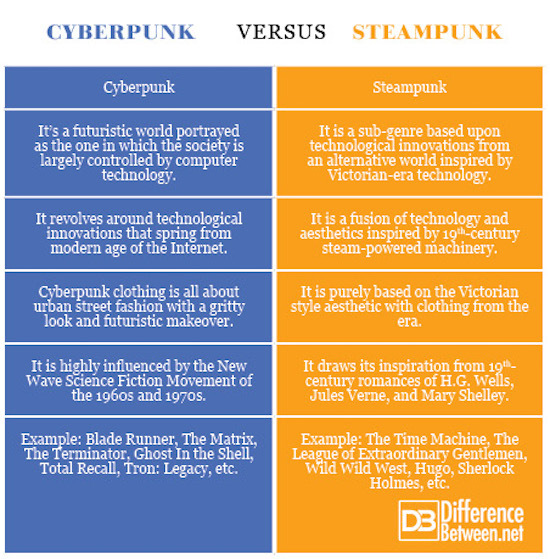 "Difference Between Cyberpunk and Steampunk." DifferenceBetween.net. July 17, 2018 < http://www.differencebetween.net/technology/difference-between-cyberpunk-and-steampunk/ >.